Remake of the 1973 film of the same name follows a larger-than-life former soldier's campaign to clean up his crime-ridden hometown. 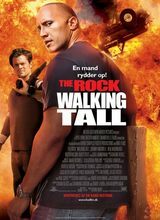 Remake of Walking Tall (1973). Chris Vaughn, a sergeant fresh off an eight-year tour of duty with the U.S. Army Special Forces, returns home to find his native community overrun with crime, corruption, and vice. Emboldened by a desire to set things straight in his once-healthy hometown, Chris embarks on a vigilante mission to break up the town's mob-dominated hierarchy, riding a wave of popular revolt that ultimately sees him elected as the county's sheriff.